you can monitor thousands of suppliers' sustainability and compliance. IntegrityNext enables organizations to monitor 100% of their suppliers for sustainability and compliance in order to meet the regulatory requirements. 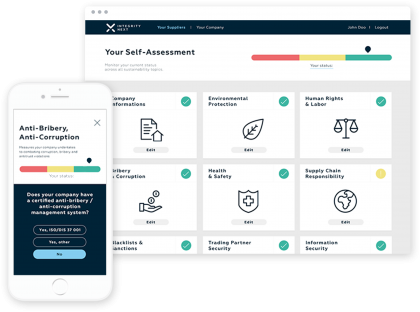 The IntegrityNext platform automatically obtains the required supplier self-assessments and certificates while monitoring social media for malpractice and reputational risks. Among others, IntegrityNext covers Anti-Bribery & Anti-Corruption, Environmental Protection, Human Rights & Labor, Health & Safety, Supply Chain Responsibility, Data Protection, Cyber Security, Business Continuity, Quality Management, Financial Information, Blacklist Checks, Trading Partner Security and Conflict Minerals. Companies in over 120 countries are using the IntegrityNext platform, including industry-leading companies such as Clariant, Fujitsu, Miele, OSRAM and Siemens.